California’s once high rank among oil-producing states continues to slip as Colorado’s output surges past the Golden State, according to the latest Energy Department data. 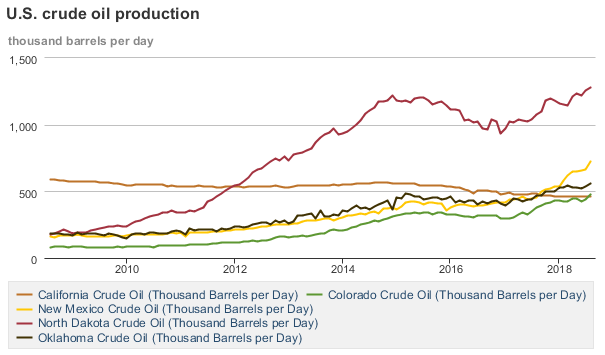 Colorado became the latest state to surpass California in terms of crude output, according to U.S. Energy Information Administration (EIA) data released Thursday. Colorado out-produced California by 16,000 barrels per day in August, the latest data shows. Colorado is the third state to surpass California in oil production in just the last two years. New Mexico and Oklahoma blew past the Golden State in crude output in 2017. North Dakota began out-producing California in 2012 due to the advent of hydraulic fracturing and horizontal drilling. North Dakota is now the second-largest oil state, producing nearly 1.3 million barrels a day as of August. Texas is still the leading oil-producing state. Alaskan oil production has fluctuated in the last few years, surpassing California crude output for stretches in 2017. However, EIA’s latest data shows California produced 33,000 more barrels a day than Alaska as of August. However, just because California produces less oil doesn’t mean the state is no longer reliant on it for fuel. In place of domestic crude, California has imported huge quantities of foreign crude oil, mostly from OPEC members. More than 56 percent of the crude oil received by California refineries came from foreign countries, according to the California Energy Commission. The biggest share of state oil imports come from Saudi Arabia. Meanwhile, the rest of the U.S. has become less reliant on imported oil due to surging production in shale plays across the country. “U.S. 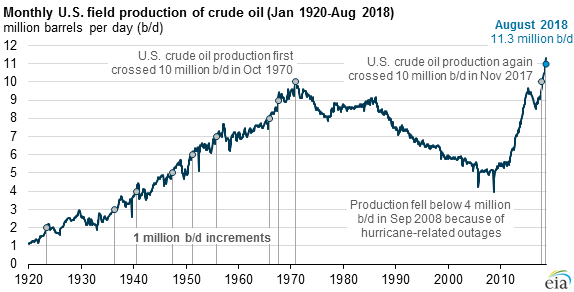 crude oil production reached 11.3 million barrels per day (b/d) in August 2018,” EIA reported. U.S. oil production also exceeded Saudi Arabian production this summer.